This winter, I have been making my way through a stack of middle-grade and YA graphic novels and memoirs. They are fun to fit in the cracks in between longer books! 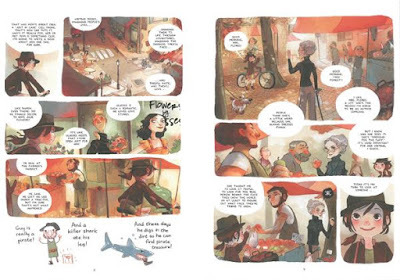 My latest graphic novel read was Cici's Journal: The Adventures of a Writer in Training by Joris Chamblain with illustrations by Aurélie Neyret. I enjoyed this unique story about an inquisitive young girl who is both a budding writer and detective. Ten-year old Cici wants to write books when she grows up, and she practices writing in her journal. Her process is to observe people and imagine their lives and their secrets. She lives with her mom and hangs out with her two best friends, Lena and Erica. In Part 1, her attention is captured by a mysterious old man who walks past her house every day, covered in paint. Driven by her insatiable curiosity, Cici starts an investigation and discovers something amazing. In Part 2, she notices another neighbor's strange habits, follows her one day, and investigates why she checks out the same book from the library every week. Cici often becomes single-minded, disobeying her mom and alienating her friends in her quest for the truth, though she also helps people and learns some important lessons about family and friendships along the way. This graphic novel uses a unique approach, with a combination of colorful illustrations of Cici's adventures (see sample above) and excerpted pages out of Cici's own journal telling part of the story. Those include photos, clipped articles, postcards, letters, and other assorted extras "pasted" into her journal, scrapbook-style. It's an immersive approach that makes Cici feel like a real little girl. Both mysteries are intriguing, and it's fun to watch Cici solve them...though you also want to shout at her not to ignore her friends! Since my friends and I used to pretend to be Nancy Drew or Trixie Belden but could never find any mysteries to solve in our quiet neighborhood, I enjoyed following along at Cici's side! To see more sample pages, click "Look Inside" here. 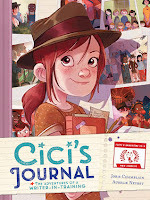 Or purchase Cici's Journal from Book Depository with free shipping worldwide.